The June meeting of KWARC saw several of our members recognized for service to KWARC over the past few years. The Ross W Carruthers Memorial Trophy recognizing the Amateur of the Year was presented to Ben Sasiela VA3BNY for his outstanding job as Program Director for the past three years. Ben has presented us with meeting after meeting of top rated speakers and I know everyone has appreciated his efforts. The Presidents Award is presented to a club member nominated by the Past President for service above and beyond. 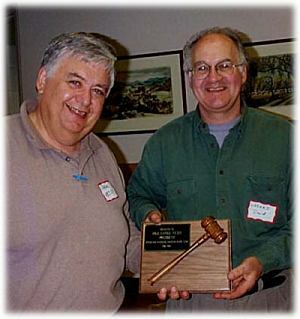 KWARC Past President Paul Cassel VE3SY (left) recognized Dave Schwartz VA3DGS (right) for his great efforts over the past few years at designing and coding the KWARC virtual swap-shop and his efforts for installing and interfacing to the web our real-time weather station recently featured on the CKCO-TV news. As a point of interest the swap-shop home page www.kwarc.org/swapshop/ has been accessed over 35,000 times since it went on line while the weather station has been accessed over 20,000 times. 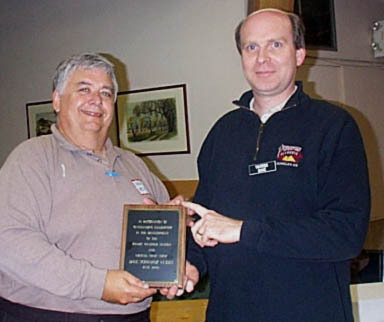 Dave has not been enjoying a lot of spare time as he also holds several other positions within the club including the club treasurer, Field Day co-ordinator and co-chairmen for the Central Ontario Hamfest. KWARC President Dave Johnson VA3MRJ presented Past President Paul Cassel VE3SY with a plaque recognizing his two terms as President of KWARC. This previous two year term was the third two year term Paul has served as president of KWARC. 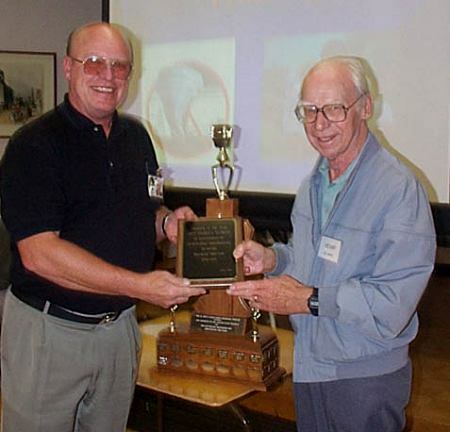 Paul has also been the KWARC webmaster since we went on line in August of 1996 and is also the webmaster for the Hammond Museum of Radio in Guelph.